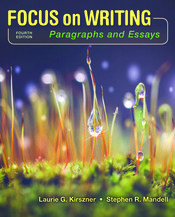 Focus on Writing offers students clear, thorough coverage of writing college paragraphs and essays in a visually inviting format and with a unique tool for assessing and revising writing: the easy-to-grasp, easy-to-remember TEST method. Reinforcing the most important elements in academic writing--Topic sentence or Thesis statement, Evidence, Summary statement, and Transitions--this practical tool helps students self-edit their writing for unity, support, and coherence. In this edition, best-selling authors Laurie Kirszner and Stephen Mandell have added even stronger support for academic and college success with a new introduction “How Writing Can Help You Succeed” and a new appendix chapter on Strategies for College Success.